During my morning runs, I almost always choose to run on the Embarcadero. It’s well-lit; populated by other people running, walking, and commuting; and equipped with bathrooms and water fountains. As a result of this route being my go-to run course during the week, the Bay Bridge is a constant in my life. It’s usually my turnaround point and serves as a point of reference for miles traveled. 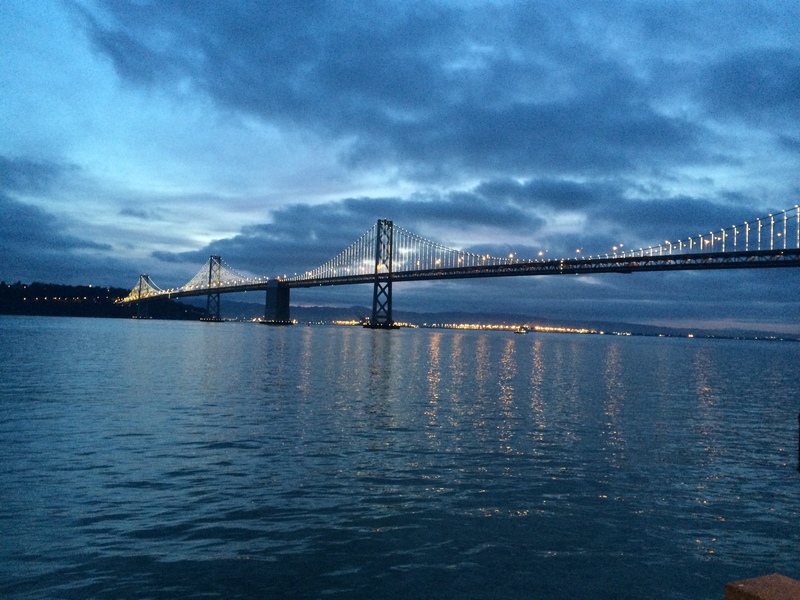 Now that the days are lengthening, the Bay Bridge is being lit up by the sun rising behind its eastern span. I couldn’t be more excited: finishing a run with the sun rising is a well-earned reward for waking up and running before dawn. Entering my apartment post-run without any sunshine a depressing reality of the winter months. I was giddy this morning to see the sun rising over the bay. I could not be more excited for the longer days and brighter mornings ahead. I seriously couldn’t be more jealous. My boyfriend drives across it everyday for work & the view leaving Marin looking over it is ridiculous. I don’t think it could EVER get old. This picture makes my heart SO happy! Aww thank you! Love hearing that. 🙂 Thanks! It’s not bad. Very nice. Great picture too! Wowza what a beautiful route you must have! A tad bit envious. Keep enjoying those lighter morning runs. Gorgeous picture. Must be amazing to run to that. Thanks! It is quite pleasant. So gorgeous! I run by the Bay Bridge all of the time, but it’s later in the day and it never looks like this! Yeah, I’d imagine your lighting is much different! Beautimus! I like landmarks when running sometimes, other times I don’t because they can remind me how much further I have to go, haha!